In the absence of blogging I have been teaching and making which is what it is all about really isn’t it? 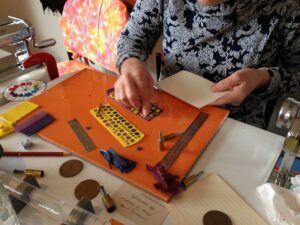 A group of us have recently been exploring colour and making lots of glorious jewellery in the Intrinsic Colour classes. On August 6 we start the three classes that make up my Extrinsic Colour (Colour 102) series. Read about it here. (Scroll down) Each class is totally self contained but they do work wonderfully as a series and those who have done all three classes so far, I think/ hope would agree. In the Intrinsic colour series (Colour 101) they used monochromatic, analogous and complementary colour schemes and created their own personal palettes. We’d all agree that we’ve pushed our selves in terms of colour choices and made some surprising and delightful discoveries. I love watching the transformation from tentative I will do this because Wendy said to take risks and be brave to WOW! I actually really like this. I can’t deny though that there is a lot of Ooooh, I love what you have done as well! Some participants deliberately chose colours they NEVER wore and discovered some really exciting palettes. We shared the ways we have learnt so much from different colour gurus like Maggie Maggio, Lindly Haunani, Tracy Holmes, Carolyn Good. We talk about the things that worked for us; the strategies that kept us energised and courageous in our use of colour. And about the things that kept us organised and grounded! And that is the joy of face to face classes. I love the videos and pdf tutorials as much as the next woman but the joy of sharing discoveries, learning from one another, the encouragement and sister/ brotherhood that comes from old fashioned classes will win me every time. In our last class we had one participant who was nervous that she wasn’t creative and had never done a class before. She was convinced her bossy sister was the creative one until the aforementioned bossy sister bossed her into doing a class. All of us old timers resonated with her delighted observation that it is so absorbing! 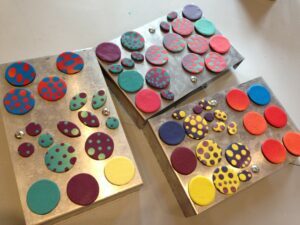 In August and September, I will be teaching three more classes but this time, rather than looking at the inherent colour properties of polymer, we will be exploring the ways we can add colour to polymer. And the first class will focus on the stuff we probably have lying around the house! No purchases to be made, just some tidying perhaps?? 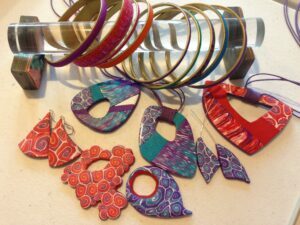 This entry was posted in Classes, Colour and tagged Canberra polymer, Carolyn Good, face to face teaching, Lindly Haunani, Maggie Maggio, polymer clay classes, taking risks, Tracy Holmes on July 11, 2017 by wendy.